Bangkok was in the midst of a revolution; Chiang Mai was in the midst of war. Rockets blew divots out of the banks of the Ping River while the trees were pocked marked with self-immolating lanterns. Across the chaos spanned the Iron Bridge. The local teenagers who overran it were clumped along the rails like caviar, tossing fireworks into the river and at each other. 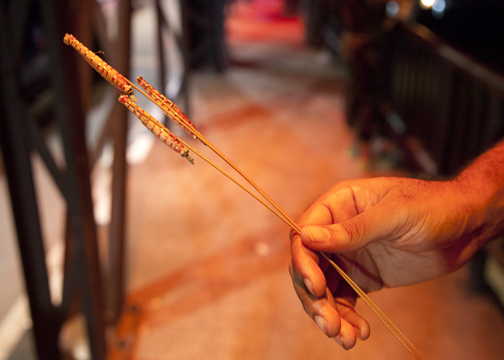 The most popular firework was handmade and tied with a red plastic cord to the end of thin reed. Notoriously inconsistent, sometimes they exploded as soon as they were lit while other times they shot across the sky. 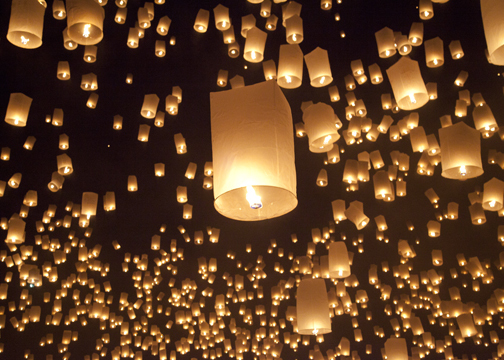 Loi Krathong is a Buddhist holiday the falls on a full moon between the October and Novemeber. 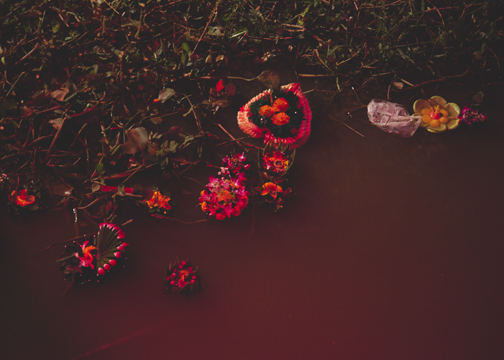 Loi means to float while Krathong refers to the decorative float that is usually made from biodegradable materials like banana leaves. 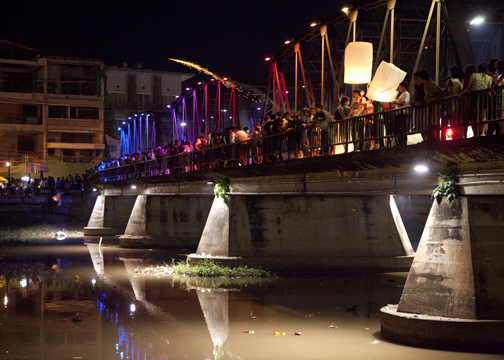 During Loi Krathong, thousands of candlelit floats are released into the Ping River and the canal around the old city walls. 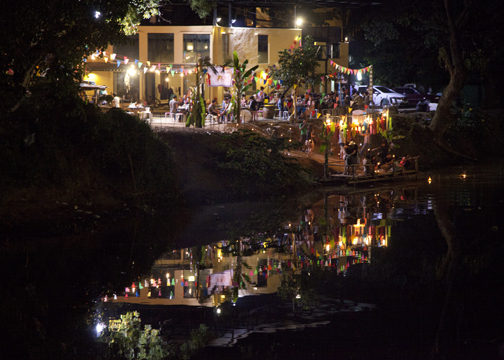 While it is a national holiday, only in the north has it become synonymous with silly amounts of fireworks and the local Lanna tradition of Yee Peng: the lantern festival. Chiang Mai was established in 1296. Today it’s one of the most culturally important cities in Northern Thailand and also one of the most popular cities on the tourist trail. People who knew it ‘way back when’ might mourn the modernization and the volume of tourists, but neither of those detract from the city. 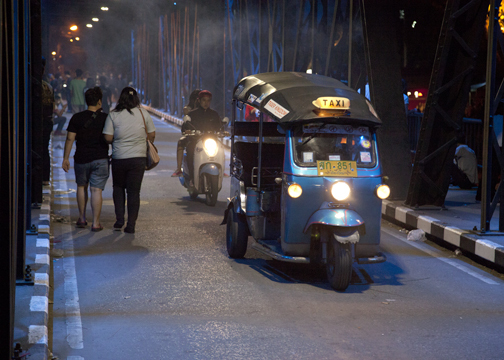 It’s not hard to dig behind the tourist façade; all you need is a moped and time to kill. One afternoon my sister and I were wandering around when we passed the Chiang Mai Technical College. The entire school was out in the courtyard inflating giant handmade lanterns. 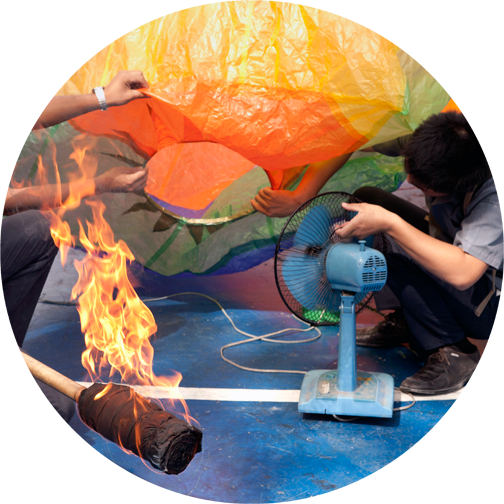 An electric fan first puffed up the lantern and after a few minutes one of the kids thrust a flaming torch inside. Right before the lantern was released, fireworks were attached and their long fuse lit. Most of the lanterns rose high over the city, some collapsed, a few burst into crackling flames over the crowd- the announcer seemed to enjoy the failures the most. 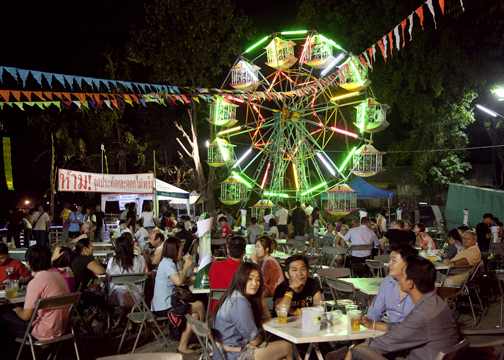 Even without the festival, there was so much to do in Chiang Mai. Tuesday night my sister and I went to the Kalare Boxing Stadium which was only a stadium by name. In reality it was a large outdoor canopy behind the Night Bazaar. 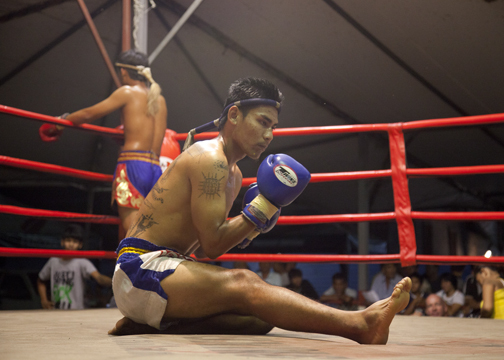 Before each match, the Muay Thai boxers performed a traditional ceremony. They began by visiting all four corners of the ring to claim their territory. This is called the Wai Khru. 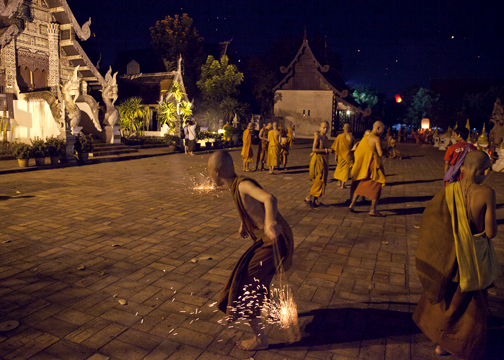 Afterwards is the Ram Muay, a dance which shows respect for the person they are fighting as well as for their teachers. After watching the dance off, I picked a winner and waved 200 baht at the wandering bookie. He had heavy, puffy eyelids and a dingy pink shirt. The overall impression he gave was that of a contentedly drunk person. A slow tempo began and steadily intensified until it suddenly crashed, ending the round. I won my first bet, but lost the following three. I couldn’t help but feel that my win had been a carefully calculated strategy. Bookies, I came to realize, only took bets that worked in their favor. Because Loi Krathong and Yee Peng bring so many people to the city, the festival lasts about a week and for 2013 it ended on Monday with the Grand Krathong Procession. It was the last of the five scheduled parades and the only one to get rained out. The parade was filled with perfectly coiffed hair and youthful faces. One particularly large group sponsored by AirAsia was just a procession of beautifully dressed couples, each followed by a shirtless and shoeless boy holding a canopy over their heads. A young guy with a loose pony tail walked alongside the procession and dabbed the sweat off the ladies’ brows. He didn’t bother with the awkwardly pubescent boy-servants. Like many of the events, they proved to be so popular that it was difficult to control the crowds. A ceremony at Wat Phan Tao was completely overrun with over-zealous amateur photographers. On the other hand, the temple next door was completely empty. Wat Chedi Luang was originally completed in the mid-15th century and is such a sacred place that no visitor is allowed up it. Most of the monks aren’t allowed either, however during Yi Peng it kind of became target practice for novice monks with itchy fingers. 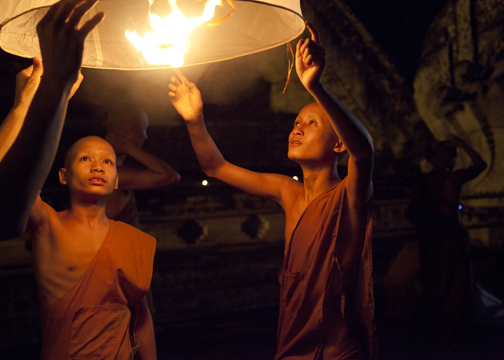 Irreverent, rambunctious, rollicking; the novice monks were an incongruous mixture of future religious leaders and uninhibited children all in one. They threw firecrackers across the courtyard and (accidentally) onto unsuspecting pedestrians. 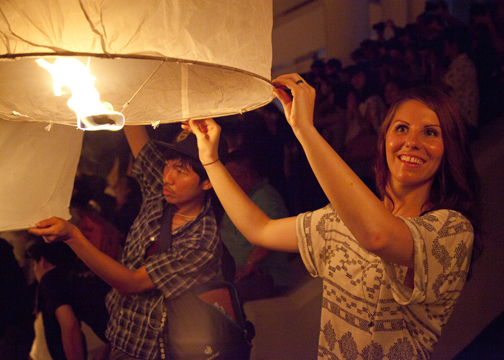 Their lanterns floated onto temple roofs and burst into eco-conscious recycled-paper fireballs. In the grand scheme of things, it makes more sense if you view the monastery as a means for education. Earlier that week Nan and I had visited Wat Chedi Luang for the Monk Chat program. It was an outdoor courtyard where monks could practice their English with tourists. Jade, a young monk around twenty years old, spoke very quietly and paused often to choose the right word. The only time he seemed confused was when my sister told him how much a year’s worth of tuition at Harvard cost. Jade quickly punched some numbers into his phone and handed it over to us. “2,000,000 baht…” He shook his head, “I could be a doctor with that much money.” His colleague’s degree cost 7,000 baht a year. While I already knew that boys were sent to the monastery because of poverty, I did not realize that they also had access to university education and were able to leave the monastery. Oddly enough, it reminded me of a popular education-incentivized program in the US: the military. 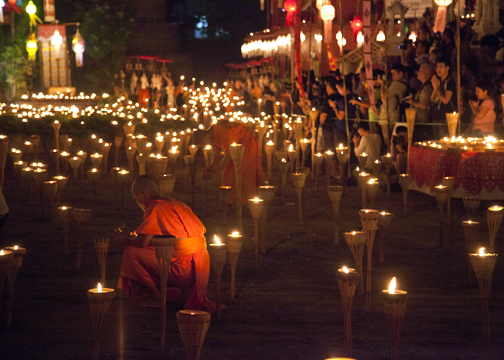 Despite how lucky I felt to have walked through Wat Chedi Luang that night, I don’t want to give the impression that the best events are always off the radar. Sometimes you want as many people as possible- especially for the Yee Peng Sansai Ceremony. The ceremony, which pays homage to the Lord Buddha and his dhamma teaching, is free and takes place on the grounds of the Mae Jo University. There is another called Yeepeng Lanna International that costs USD $100 and is geared only towards tourists. The ceremony was fairly lengthy and conducted entirely in Thai by a monk with a peaceful voice. When the chanting finished, the call was given to light the lanterns. 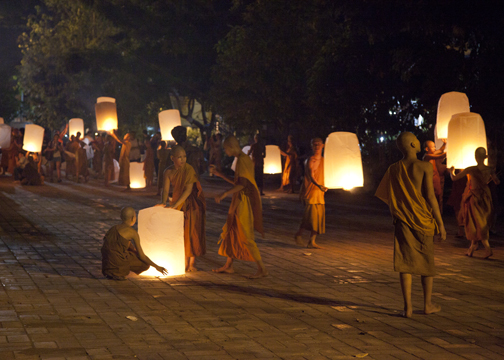 All of the Dhammachai lanterns were the same; Thai Industrial Standard 808/2552: 90 cm diameter, recycled tissue paper, a few strips of bamboo and a few heat proof threads. The wick was a disk of compressed paper. The lantern felt more fragile that an eggshell when we held it, but it was surprisingly durable. Grey smoke slowly filled the interior cavity and smoothed out the wrinkled paper. When the lanterns were buoyant, a canon rang and each one was released at once. 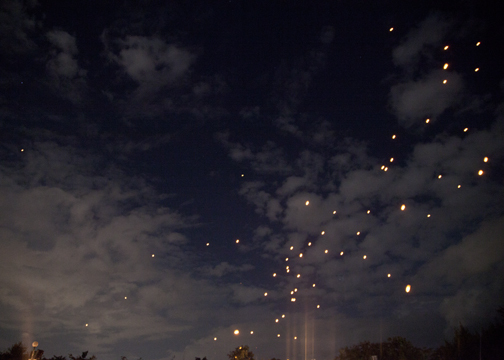 They quickly rose and spread out in the sky like jellyfish drifting in an ocean current. I wasn’t the only one who let out a gasp; my sister quietly teared up. Amazing Stuff! Why has no one else discovered you?! Me too! We should get together and collaborate!